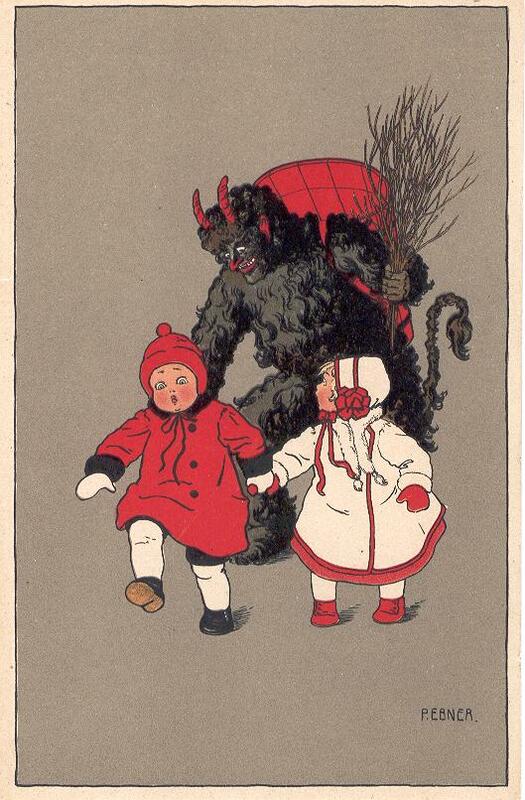 Did the Krampus visit you last night? If so, you’re reading this from a warm location, eh? Perhaps you were good and Saint Nikolaus filled your shoes with goodies (check before putting them on). Our pal Joey (illustrator, designer and inspiration for my chapbook When Little Joe the Krampus Met) sent along this link to some Krampus stylin’ by Mister Reusch. We spent the evening with some friends near campus at Mahar’s adding to our passports and doing the usual moaning about students before moving on to interesting topics like British comedy (who’s obsessed?). Then we headed home just in time to meet Robert for some DeFazio’s pizza (mmmm). He came up to show us how to give Jordan his insulin shot, because that’s what we’ll be doing tonight while he’s down in the city for a Bard event. Eeek! I practiced on a satsuma. Let’s hope it’s enough. Previous Post Gene K Superstar! The latest issue of Linda Medley’s Castle Waiting has a reference to the Krampus tradition. Of course, her books are worth reading for the wonderful stories and exquisite drawing anyway.